BikeNZ endurance rider Cameron Karwowski shares a slice of his life as a professional cyclist with Fairfax cycling writer NATHAN BURDON in a regular spotlight on New Zealand professional cyclists competing overseas. 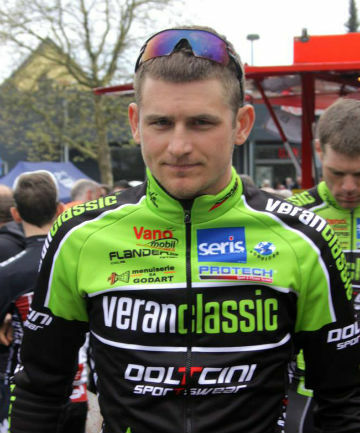 For the 2014 season I am riding for a Belgium Continental Team called Veranclassic- Doltcini. There are three levels of professional teams in the cycling game, World Tour, Pro-Continental, and Continental. My team has a great race programme all across Europe, so I've been able to race against the best-level pros week in and week out. The team has a wide variety of riders from Japan, Lithuania, Italy, Holland, France, Germany, and of course Belgium, leading to some interesting team meetings and a few good laughs. On top of this I am a reserve for the NZ Commonwealth Games team on the track. I live at the BikeNZ base in Oudenaarde, Belgium. Oudenaarde, which is 30km south of Gent's indoor velodrome, is a great base for the NZ team over the European summer. Living in the heart of Flanders also offers amateur racing in the form of a 100-120km "kermesse" [the name means carnival, named after the bike races that used to coincide with local town festivals] almost every day of the season. During the weekend there can be up to 20 races running on the same day, it's not uncommon to have 300 riders competing in these races. Over June the NZ team (Commonwealth Games and reserve riders) completed three blocks of intense track training in Gent to prepare for the final prep in Bordeaux, before heading to Glasgow for the Games. I won't be travelling to Bordeaux, as everyone is healthy and injury free. Instead I'll be staying in Belgium and racing for my team until mid-September with another Kiwi, Hamish Schreurs, who is also in the team. It's been a great season so far with races in Germany, France, Holland and Ireland. The highlight of my time in Europe so far has been riding the Tour of Ireland, known as the An Post Ras. The tour was 1260km over eight stages, which completed a circuit of the lower half of Ireland. Riding for the New Zealand national team, I played a supportive role with Patrick Bevin winning two stages, and taking the race lead for a number of days. As a team we attempted to defend the yellow jersey. This became impossible halfway through the tour after Marc Ryan and Liam Aitcheson pulled out with sickness, leaving only three riders in the team. We didn't go down without a fight and tried to ride the final four days (600km) with only two of us riding the front. We eventually couldn't fend off all the attacks or climbs anymore, and lost the race lead. We still kept trucking away and helped Paddy come away with the points classification jersey. The low point of my trip came during a professional race called "Rund um Koln", in Germany. It was only my second race in Europe, it was 200km on a cold, dark and rainy day in the hills around Cologne. At one point the peloton was absolutely flying down a steep descent in the wet and there must have been oil on the road, as just in front of me lots of people started hitting the deck. Knowing you're about to crash onto tarmac at 60kmh wearing only Lycra is not a great feeling! I was banged up with cuts all over my arms, hands, and a chain ring in the leg. I rode away from the crash counting my lucky stars as there were many others a lot worse off than me. I jumped in the broom wagon (the vehicle picking up the stragglers) which, on this day, was a commuter bus. The bus driver had to keep up with the race so he was driving like an absolute madman in the wet, on blind corners, all on the wrong side of the road. There were about 40 cyclists piled in with bikes before the end of the race, all with white knuckles - holding tight to their seats in the rally bus. The most dangerous thing I have done this year was during a five-day tour on the coast of France, aptly named the "Four Days of Dunkerque". It was a very tough tour with a number of pro-tour teams competing, and some of the superstars of the sport. The tour was made even more difficult by gale-force winds blowing straight in from the English Channel each day. During a tailwind section of one stage we blasted through 5km in around four minutes. I was going 90kmh mid-pack. Ahead I could see a railway crossing and its lights start flashing red. The speed limit for the crossing was 30kmh because it was so rough. The barriers started coming down, but there was no chance of stopping, or even slowly down. I managed to sneak under them at 85kmh and bounce over the rails. I've just completed three big races over four days. I finished 11th in a professional kermesse against a number of pro-tour riders, which is my greatest personal result of the season. It's great to be able to go toe-to-toe against the best in the business. Some days it's really difficult facing 200km of racing, but I know it's only going to make me stronger. I've also just finished my first semester of exams through Massey as I work towards a Bachelor of Business Studies degree. With only two papers to go, I hope to be finished and graduating at the end of the year.